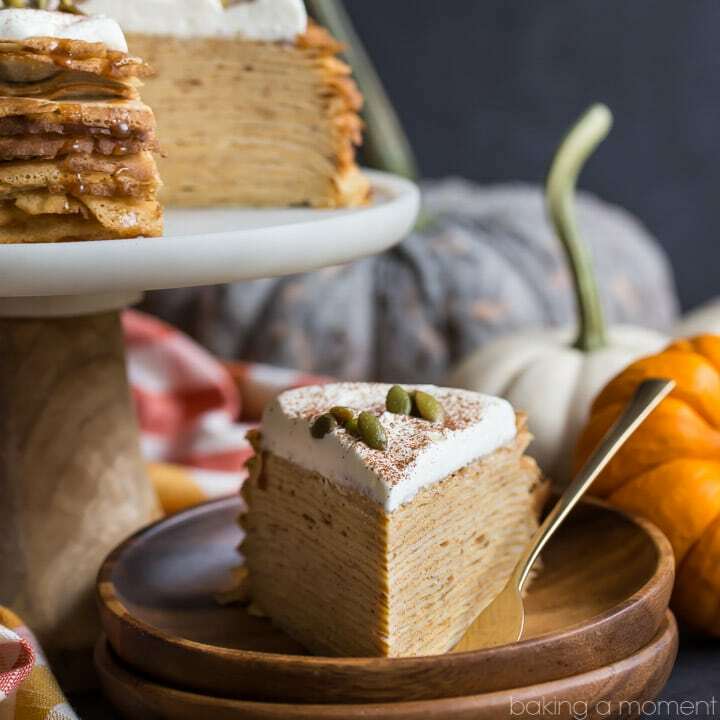 It’s about time this pumpkin crepe cake finally happened. A little less than a year ago, I tried my first Lady M’s crepe cake. Have you ever? Holy moly. You’d never think something so simple could be so incredibly delicious. There’s just something about all those layers, the eggy crepe with the fluffy whipped cream. It was a moment I’ll never forget. I instantly knew that a pumpkin version needed to happen. But *sigh. * Sometimes life gets in the way. Before I knew it, we were past pumpkin season and had moved on to peppermint and eggnog world. 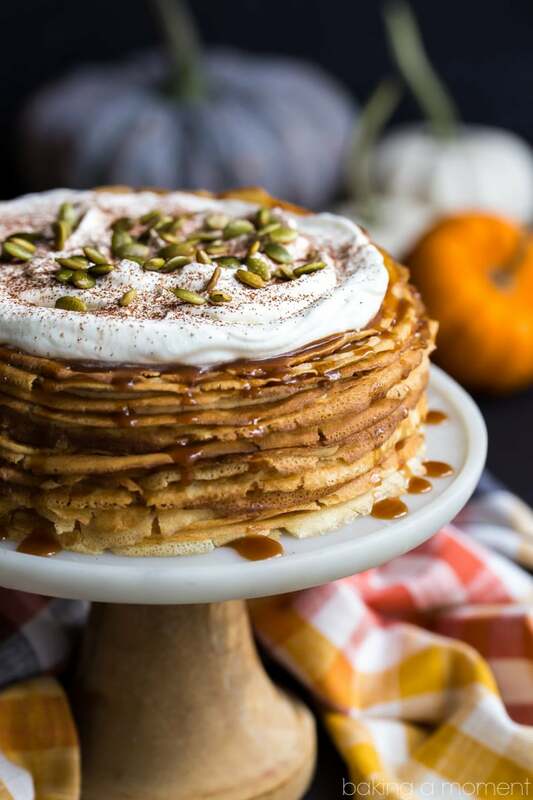 The pumpkin crepe cake idea fell by the wayside. But I made a mental note, and have held onto it all this time. I know it probably looks like a lot of work, but it’s surprisingly easy. After a while it becomes kind of meditative. I spent a little less than an hour in front of the stove, flipping crepes. You need about 24 total, and each one only takes a couple of minutes to cook. After a while you get into a good groove. Pour, swirl, flip… pour, swirl, flip… pour, swirl, flip. Before you know it you’ve got a big stack. Then just layer them, spreading a thin layer of fluffy-whipped spiced pumpkin pastry cream on top of each one. This is basically the same filling we used in those caramel apple cream puffs, only with cinnamon, ginger, cloves, and pumpkin puree folded in (click here for a video tutorial). It’s so creamy and light- with just the right amount of fall flavor. 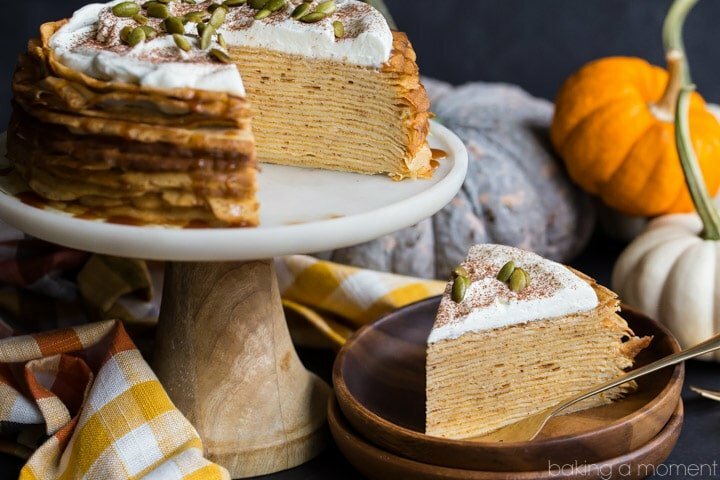 I think this pumpkin crepe cake is perfect for a Halloween party, Thanksgiving celebration, or any other get-together you may be planning this season. Place the eggs, milk, flour, butter, and salt in a blender and blend until smooth. Pour in 2 to 3 tablespoons of batter, swirling the pan to coat the bottom evenly with batter. Cook until golden brown on the bottom, then flip and cook for an additional 2 to 3 minutes to brown the other side. Transfer the cooked crepe to a wire rack to cool, then repeat until you have used all the batter. Whip the cream and powdered sugar together until stiff. Fold the whipped cream, pumpkin, and spices into the pastry cream. 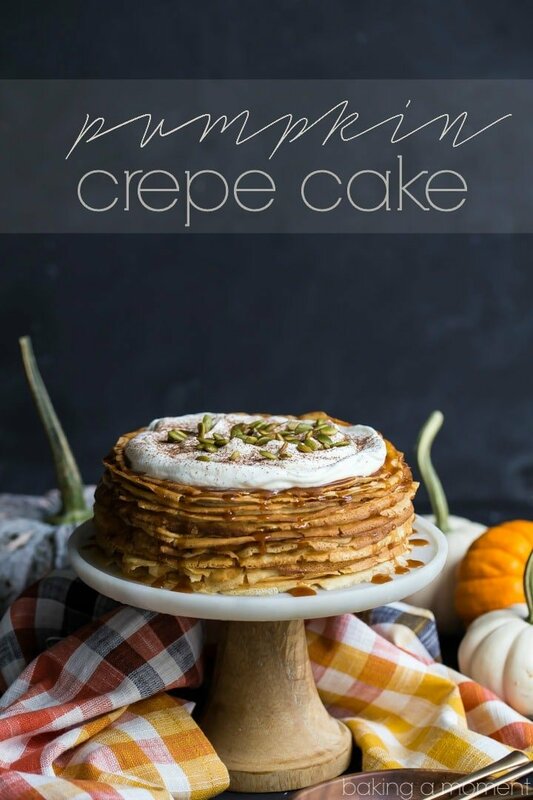 Place a crepe on a serving platter, and top with about 2 tablespoons of spiced pumpkin pastry cream, spreading it in an even layer. Top with another crepe, and repeat until all the crepes and filling have been used. Garnish with salted caramel sauce, sweetened whipped cream, cinnamon, and toasted pepitas (optional). That looks amazing! I’ve never made a crepe cake before, but I’ve always wanted to. This pumpkin version sounds perfect. Do you think you could make the cake a day in advance of serving it? Or would the layers get soggy? I’m so glad you brought this up Annie! I had meant to mention it in the post but it slipped my mind- I would definitely recommend making it a day ahead. That’s what I did, and it gave everything a chance to meld and sort of solidify, so it was easy to cut without everything sliding around all over the place. Just make sure to cover it loosely, otherwise the crepes will dry out. Thanks for the great question! This is GORGEOUS!! I love it! It’s so simple and beautiful. Crepe cakes are so easy to make. Thank you! They really are it’s just a matter of stacking them up. Thanks Zainab! I would be happy to share with you if we were! Thanks so much Linda! It’s been so long since I’ve made a crepe cake. They are so stunning and yes, so simple to make. I am sure this pumpkin version is incredible! Aren’t they so much fun to make? I’m so happy you like this version Amanda. Thank you! This crepe cake is absolutely stunning, Allie! 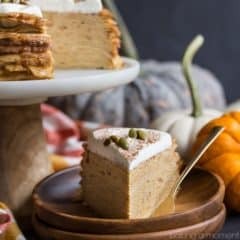 I love your cozy fall version with the yummy pumpkin pastry cream! Sounds SO amazing! Thank you so much Kelly! 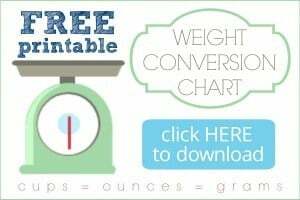 I have been hanging on to this idea for so long- it’s so nice to finally be able to share! Your talent is so unmatched! Your recipes are always PERFECT! I’ve made a few crepe cakes, and you are totally right – it does become meditative as you are making all the crepes. It becomes sort of a soothing ritual! Lol! I’ve made 3, and they’ve never turned out! My crepes always start to slip and slide, and they make whatever frosting or cream I’ve used start to get watery? Even if they are cooled first, or refrigerated. It’s strange. I’ve basically given up because I never could figure out what I’m doing wrong. Any idea? Maybe I’ll try your crepe batter next time! This is seriously gorgeous! My first crepe cake was like that! So this time I made sure to cool each crepe on a wire rack so that the steam wouldn’t build up and make them soggy. I also cooked them a little longer & a little browner. And the fluffier whipped filling seemed to make a difference too. Thank you so much for the sweet compliments Sarah! I hope those tips help; crepe cakes are such a delicious treat when done well! Awesome recipe! That pumpkin pastry creme sounds amazing! Is the fluffy pumpkin spiced pastry cream recipe posted? Hey Sue! I am so sorry about that. Seems there was a glitch with my recipe card plugin and the last half of the recipe wasn’t displaying. It’s all fixed now; hopefully not too late for you! My apologies! Whoa, this tastes as fabulous as it looks! Crepe cakes are always so pretty, and your ability to get them all the same size is amazing to me 🙂 Looks amazing! This will be a gorgeous addition to the dessert table for Thanksgiving! Definitely a showstopper! This is the best recipe I found for what I want to make for Thanksgiving- tomorrow!! – but now I can’t use it. Pretty disappointed. I’m not really feeling up to winging it, as we will be serving guests as well as family. In one of your replies above, the problem has been previously mentioned; you respond stating that it had been resolved. I think that was a couple years back. ?? I wish it had been! I wonder how many people have come across this wonderful recipe of yours allllll this time since you posted it….. but then simply moved on because it was incorrect/incomplete?? It’s too bad. Hopefully?? You’ll see this and be able to respond ASAP!! Thank you & HAPPY THANKSGIVING 2018! Hey Rachael! The pumpkin and spices just get folded into the pastry cream, along with the whipped cream. Not sure why that is not displaying for you- if you have time could you let me know what browser you’re using? Because I am seeing it fine on Chrome. Hope that’s helpful! Happy Thanksgiving!